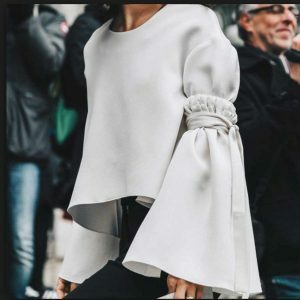 Ooooh, I love a bell sleeve – so reminiscent of the 70’s. I love the feminine swishy feel they give you and the drama they add to an outfit! 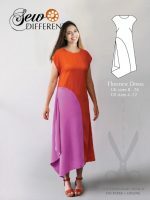 My Bell Sleeve Dress pattern, in keeping with the 70s feel, is a gentle A-line shape that finishes just above the knee. 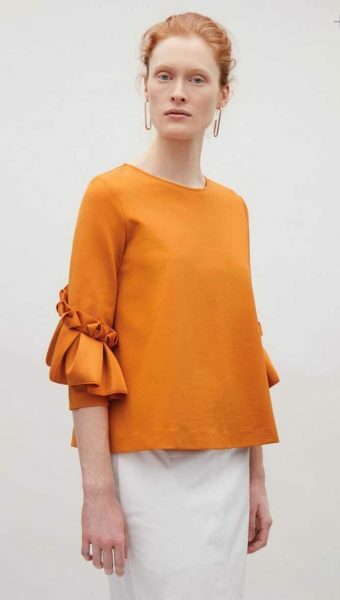 It has feature seams on the front with a V shaped bodice and flattering side panels that can be replaced with a different colour for a trompe l’oeil silhouette. 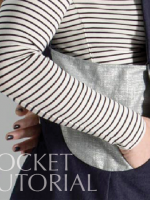 The sleeves are slim to just above the elbow. 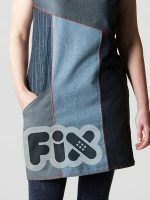 The cuffs then flare out with box pleats to a three quarter length sleeve. Like most of my dresses, it’s a throw it on over your head affair with no zips to contend with. Here are my original drawings for it, along with the polka dot fabric swatch. 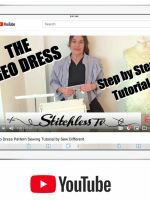 There is a time-lapse video clip on Instagram which is quite fun to watch – 15 minutes concentration crammed into 1 minute! 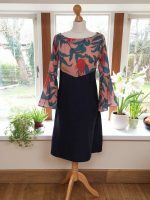 My inspiration for this dress was, in particular, drawn from this amazing orange top I saw in Cos at Christmas. I can never bring myself to buy anything I could make so I didn’t buy it in the end…. and of course didn’t actually make it either (groundhog day). But it did at least motivate me to design something with a similar feel. I had also saved this image of the fabulous grey sleeve from Pinterest recently which was another push in the same direction. While it’s gorgeous, having a flared sleeve that long it pretty impractical, hence the three quarter length of mine. 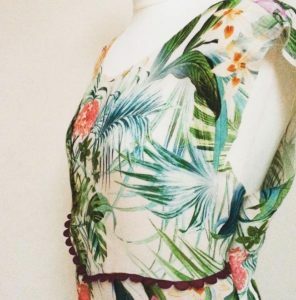 Fabrics for the pink pattern cover dress: I fell in love with this pink tropical fabric that I saw online from the Fabric Godmother. 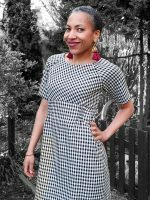 £15 / m. After I’d bought it, I realised that I didn’t have enough to make the entire dress, so I paired it with a super-soft chambray and added PINK top stitching to accentuate the diagonal seams. 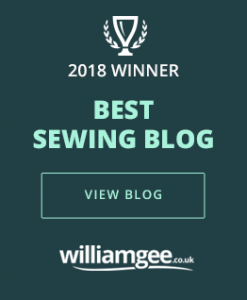 Subsequently, I’m really pleased about my quantity mistake because it would most certainly have been over the top in top-to-toe pink and the chambray accentuates the V shaped bodice better than a single fabric choice ever could. 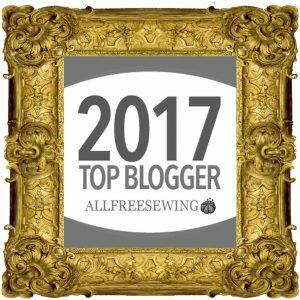 Fabrics for the polka dot dress: I used a gorgeously soft chambray for the base of the dress with a feature panel of a jacquard polka dot. The polka dot is a wool / silk blend from Fabworks that comes in several different colours including a mustard/ grey and a very chic black on black. It’s actually a furnishing fabric I think, but it’s very light weight and perfect for dressmaking. (Priced a round £10 / metre I think, but can’t be sure). I’m afraid you won’t find it on the website though – it’s shop-only stock. 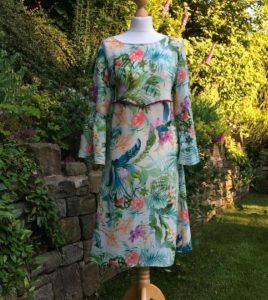 Fabrics for the tropical dress: This tropical version of the Bell Sleeve Dress is made from a lightweight crepe (from an Ebay shop called fabricshopUK) and trimmed with a magenta scalloped embroidery to highlight the V-shaped high waist.